전세계적으로 가장 큰 Retail 마켓인 미국에서 Market Update의 역할을 하고 있습니다. 전반적인 업계 트렌드는 물론 바이어 및 Sales 동향을 중점으로 Market Intelligence 기능을 수행하고 있으며 멕시코 MEXMODE와 KUKDONG TEXTILE의 지주회사(Holding Company)로서 현지 공장의 생산계획 및 관리를 담당하고 있습니다. 1999년 멕시코 MEXMODE에 편직, 염색, 봉제, 자수, 나염 등 일관공정 생산설비를 갖추어 NAFTA 관세 혜택으로 대미 수출 교두보를 마련하였습니다. 2014년부터 원단 편직, 염색, 가공기계를 최신 친환경 설비로 교체 완료하여 생산성 및 효율 증대, 에너지 사용 절감과 환경오염물질 배출을 획기적으로 줄여 친환경 기업으로서 이미지 제고는 물론 북미 최고 원가경쟁력을 확보한 섬유 제조 업체로 발돋움하였습니다. 플리스(Fleece)와 저지(Jersey)를 사용한 어려운 스타일의 헤비 가먼트(Heavy Garment) 생산에 특화되어 있습니다. 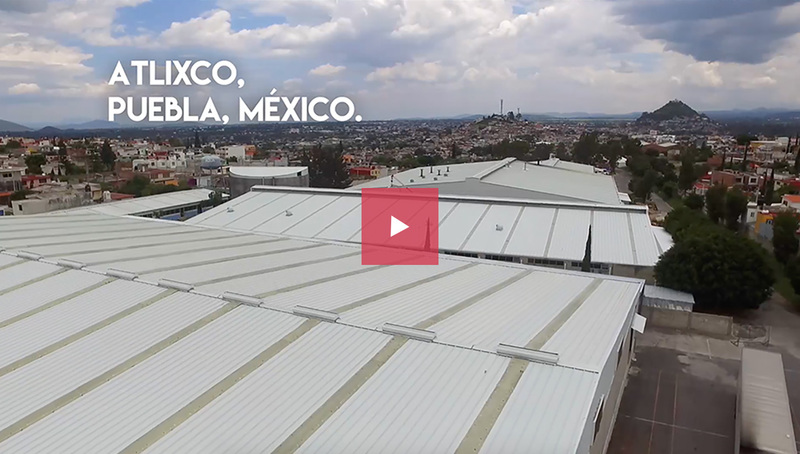 In 1999, we established a production base for exporting to the United States with the benefit of NAFTA tariffs with vertical production facilities in Mexico – starting with knitting, dyeing, sewing, embroidery and printing. Since 2014, Mex Mode has replaced its fabric knitting, dyeing and processing machines with the latest eco-friendly facilities. It has established a presence as an eco-friendly company by reducing energy use and decreasing pollution to the environment. Manufacturing efficiency has improved, productivity has increased, and we have remained cost-competitive. The facility specializes in the production of heavy-duty garments using fleece and Jersey. 국동은 2017년 인도네시아 스마랑(Semarang) 공장에 구축된 15개의 신규 생산라인을 포함하여 버카시(Bekasi) 공장 15개, 스마랑(Semarang) 공장 48개 등 총 63개의 생산라인을 확보하고 있습니다. 추후 바땅지역에 40개 라인이 추가 증설되면 총 생산량이 30% 늘어날 것으로 예상됩니다. 인도네시아 생산라인은 폴리(Poly) 원단 위주의 라이트 가먼트(Light Garment) 제품으로 특화되어 있으며 자체 생산과 외주생산을 병행하는 생산 이원화 전략을 통한 안정적 수익구조를 확보하고 있습니다. 또한 선수주 후생산 방식의 비즈니스 모델을 구축하고 있어 재고나 반품 부담이 없는 최적의 원가경쟁력을 보유한 사업구조를 가지고 있습니다. 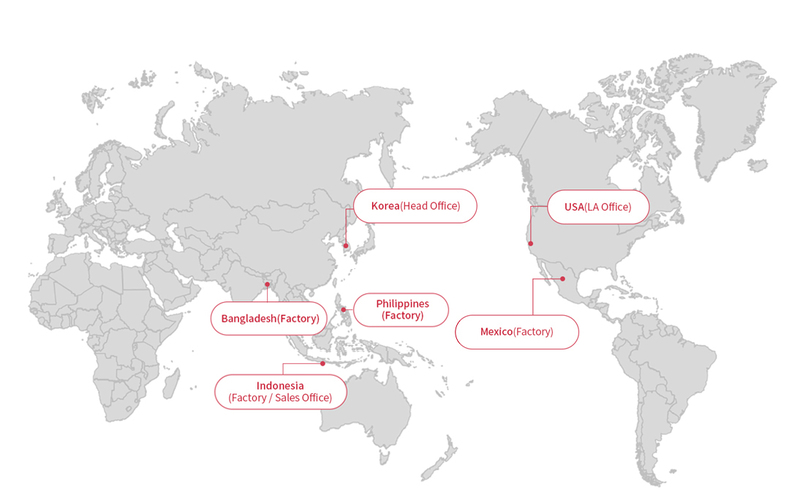 Kukdong has a total of 63 production lines in Indonesia; 15 lines in the Bekasi factory; and 48 lines in the Semarang factory (this includes the 15 new production lines built in 2017 in Semarang, Indonesia). If 40 additional lines are added in the future at the Batang facility, the total production volume is expected to increase by 30%. The Indonesian production line specializes in light-weight garment products fabricated with a poly base. We are securing a stable profit structure through dual strategies using our own and outsourcing production. In addition, we are building a business model in which production starts only after the orders are received, thus we have a business structure that has optimal cost competitiveness without the burden of inventory or returns. 인도네시아에 현지 세일즈 오피스(Sales Office)를 설치하여 Nike, H&M, Adidas, Asics 등 바이어로부터 오더를 수주, 생산 수출하고 있습니다. 샘플 작업과 원부자재 수급, 생산계획, 관리 등을 인도네시아 현지 공장과 협업하여 진행함으로써 바이어 요구사항에 더 긴밀하고 빠르게 대응할 수 있으며 Lead Time 및 비용 절감이 가능하고 품질 안정화가 가능합니다. 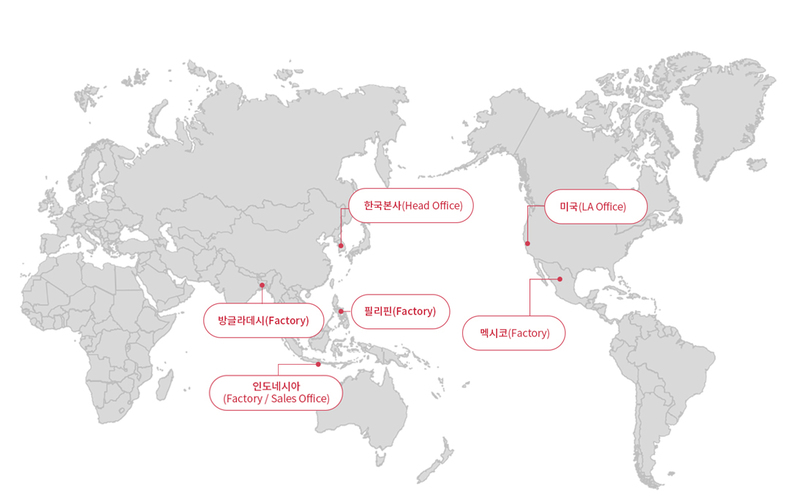 Kukdong has set up local sales offices in Indonesia to receive and ship orders to buyers such as Nike, H&M, Adidas, and Asics. Sample work, procurement of raw materials, production planning and order management are carried out in cooperation with local factories in Indonesia. This allows Kukdong to respond more precisely to buyer requirements, therefore reducing lead time and cost, and increasing product quality. 1989년 선진국의 섬유 쿼타 장벽에 대응한 경쟁력 제고를 위해 진출, Jakarta 근교 Bekasi에 공장을 건설하고 의류 생산을 시작하여 선진국의 섬유 쿼타(Quota) 장벽에 대응해 경쟁력을 제고 할 수 있었습니다. In 1989, we built a factory to produce apparel in Bekasi, near Jakarta, Indonesia, which enabled us to increase our competitiveness in response to textile quota barriers in developed countries. 스마랑은 인도네시아 인구의 60%가 거주하는 자바섬에 위치한 다섯 번째로 큰 도시로 인구가 많은 만큼 유휴인력이 풍부하며 근로자들의 손재주도 좋아 생산제품의 품질은 익히 검증된 바 있습니다. 2000년대 들어서서 스마랑 지역에 55개 봉제 라인을 건설하여 H & M, Nike, Majestic, Forever21 등의 거래선과 지속적인 거래를 하고 있습니다. 2016년 글로벌 SPA브랜드 H&M의 추가 오더분 생산을 목적으로, 15개 생산라인을 추가로 구축했습니다. 인도네시아 바탕에 40개 라인의 대규모 공장이 완공되면 본격적인 해외생산 허브 역할을 하게 될 것입니다. 바땅공장은 현재 인도네시아 중앙정부의 건축 허가를 기다리고 있으며 완공 시 국동의 총 생산량은 30% 늘어날 전망입니다. When the large-scale factory of 40 lines is completed in Batang, Indonesia, it will become a comprehensive overseas production hub. 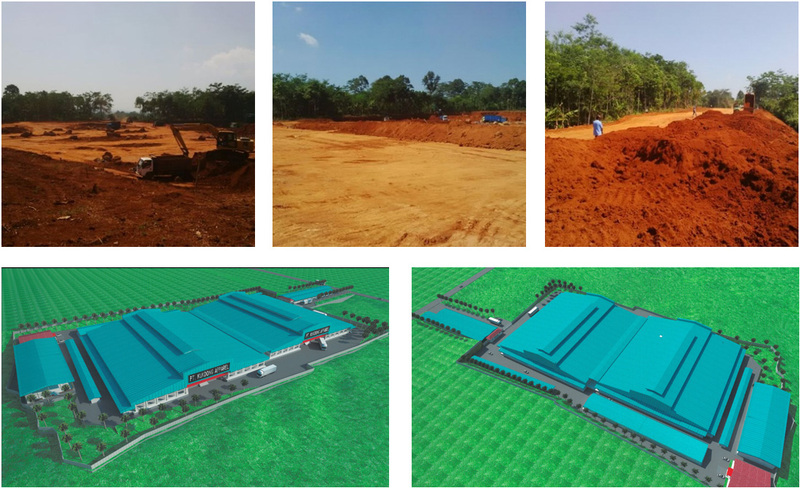 The Batang plant is waiting for the final building permit to be issued by the Indonesian central government. 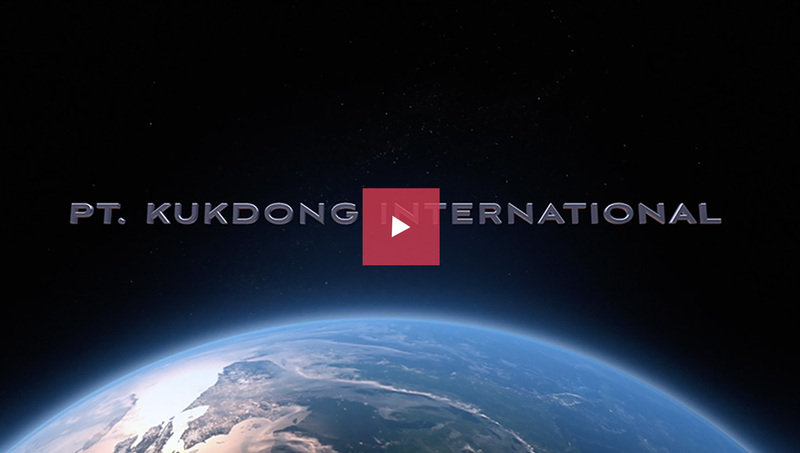 The total output of Kukdong is expected to increase by 30% upon completion of the factory.